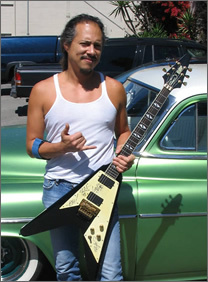 The Ibanez Musician was born out of the Japanese copy boom of the 1970s, which also helped spawn the Ibanez Destroyer and Iceman. 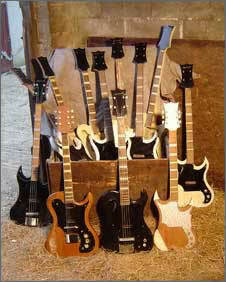 After Ibanez were sued for copying Gibson designs they branched out into original designs. 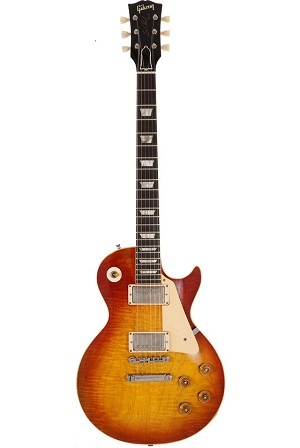 Their first original models were the aforementioned two guitars, as well as the Performer, a Les Paul-type with a small curve cut into the bass side of the neck joint.This design has been more famously used by another Japanese company, Aria, on the iconic PE series. Around 1978 the Performer was followed by the new Studio and Musician series. The Musician was a more conservative piece of design than the wild stylings of the Iceman and the â€œExplorer-on-steroidsâ€ look utilised on the Destroyer. It had a body shape halfway between a Stratocaster and a Les Paul, the same overall shape as a double cutaway PRS, although of course those guitars came about five years later. 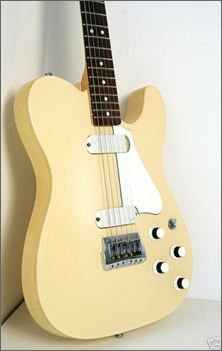 The most basic model was the MC100, with a bolt-on neck, although all the others, up to the custom order MC550WN model (of which only 465 were made), were neck-through. The Studio series is less well-known, and less upscale than the Musicians. The Studio series all had set necks, although this was the only main difference to the Musician. This new series of guitars were known for their excellent sustaining properties, although this did lead to extra unwanted weight. The woods used were usually walnut and maple (for the through-neck), plus ash or walnut â€œwingsâ€ which formed the actual body. 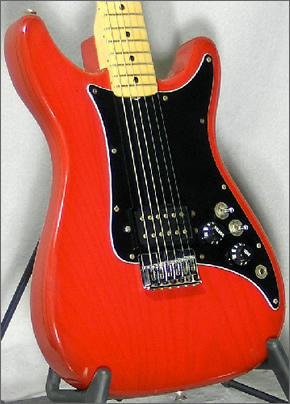 Pickups were Ibanez Super 88 humbuckers, and the high-end MC500 had an onboard three-band EQ activated by a toggle switch. This gave the player free rein to create a properly unique sound, for when the other two toggle switches activating phase reversal and coil splitting of the pickups just werenâ€™t enough. The MC500 had controls for the passive pickup mode, and three more knobs for when the EQ switch was on. The passive controls were a master volume, master tone, three-way pickup selector and the coil split and phase reversal switches. When the third toggle switch was activated the active controls (a different knob type to avoid confusion between the passive and active controls) controlled Bass boost, Midrange boost and Treble boost. The control layout for the Musician MC500, while vast, was quite simple and easy to use. 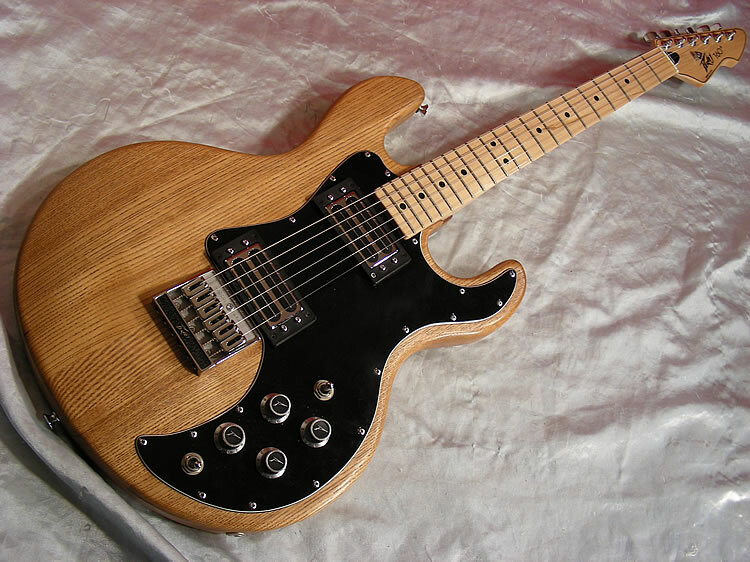 The EQ allowed for a vast spectrum of sounds, and the beautiful woods, through-neck, carved top and huge sustain made the MC500 one of the more desirable guitars of the late 1970s. 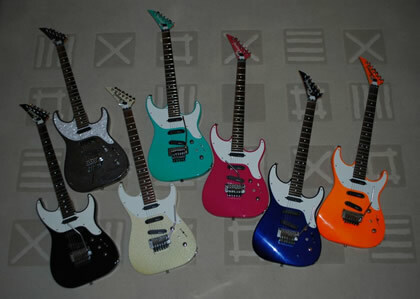 There are also many good reviews of the other guitars in the series, and the models have a cult following among players. The guitars arenâ€™t too rare, but can be fairly hard to find sometimes. 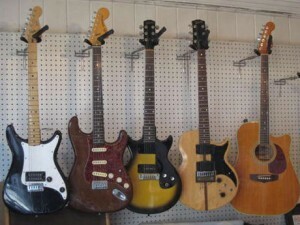 A recent search on eBay uprooted a few guitars, mostly in America. An MC500 is going for just under Â£1100, while another MC200 looks to be going for significantly less. Every review I have read of these guitars praises them, particularly the MC500, and they are worth quite a lot now. Below is a picture of a beautiful MC500 (albeit with no strings attached), and I will attempt to explain the control layout. This guitar was originally made from 1982 to 1984 in Japan by Tokai, who at this point were looking to expand away from the copies they specialised in. It was very unusual in that the body was not made of wood, as you might expect, but aluminium instead. As such the name was actually an acronym for Tokai ALuminium BOdy. The benefits of using aluminium were sustainability- no trees get chopped down to make enough aluminium for a Talbo body, and a different sound. The aluminium body was mostly solid, but with a large hollow chamber for the controls and for weight reduction. It had Blazing Fire pickups, usually a bridge humbucker and two single coils although two humbucker versions are not uncommon. The neck is made of maple and is bolted to the body. The Talbo Blazing Fire is a quality guitar, comfortable, easy to play, with a great sound. If there’s a limitation, it’s that the three-way select limits the tonal potential, although this is mitigated somewhat with the two volumes. 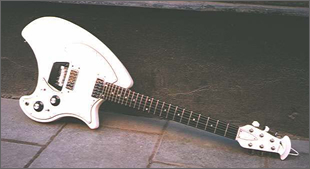 Perhaps the most famous appearance of the Tokai Talbo in the 1980s was in the hands of the band Devo. 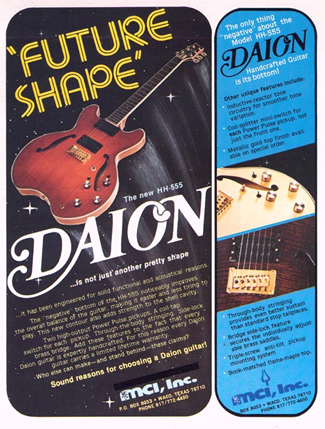 Tokai Talbos were promoted briefly in American and European markets for perhaps a couple years, but after 1984 seemed to disappear from the radar. They didn’t disappear Â though. The Talbo appears to have continued in production in Japan since its ’82 debut. And what’s more, it continued to evolve. What had been called the Blazing Fire became simply the Talbo, in its present state offered with twin humbuckers. 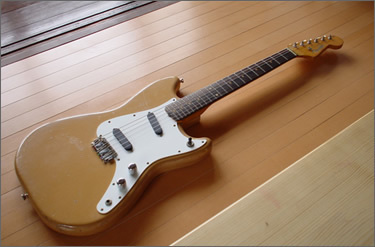 In 1999, Tokai introduced the Talbo Woody, an all-wood version made of two hollowed-out pieces of maple. A more interesting variant was the Talbo Junior that debuted in 2000. It takes the teardrop-shaped sound chamber and encapsulates it in cast aluminum, then hollows the top of the body and cutaway horns, making them just a frame. Then, to spice things up, it adds a built-in amplifier under the strings. That same year, the Talbo’s body was extended and turned into the Talbo Bass. And finally, Tokai brought back the Blazing Fire moniker on a fantastic blue-tinted transparent plexiglass version, still with the 3-D Talbo shape, but with no aluminum. These are produced in Korea. So what of the original Talbo? Well, prices probably are about Â£700-Â£1000 for the guitars and basses, while the new Woody models are probably significantly less. Ampeg then asked Armstrong to design some guitars and basses for them to market. 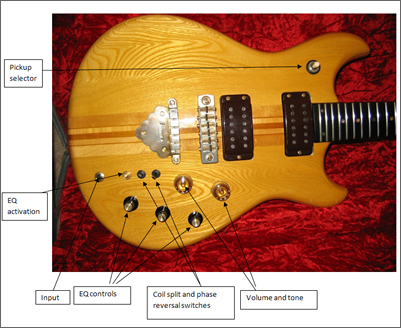 The design he came up with resides somewhere between a Strat and an SG, but with a surreal twist: the body was made entirely of a solid slab of Plexiglas (the trade name for a type of rigid, clear plastic) and the scratchplate of a piece of the wood-grain replica pattern Formica, popular on furniture in the 1960s and 70s. The other very novel and inventive feature of the Dan Armstrong was the electrics arrangement. There was only one pickup â€œslotâ€, at the bridge position. 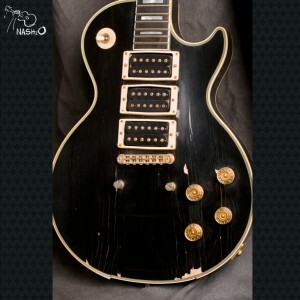 There was no pickup actually installed, but specially designed self-contained pickups were available, a twin blade humbucker or a blade single-coil. 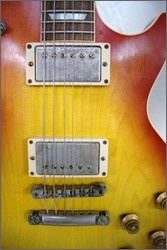 All the pickups were contained in the same size casing, but the upside was that the two types of pickups could be slotted in very easily and with no complex modification required. There was also an inbuilt volume boost circuit. There were a couple of clear upsides of the Plexiglas Ampeg, which was available as a guitar or bass. The solid Plexiglas body had a lot more sustain than most other guitars available at the time, new pickups could be slotted in easily with the radical circuitry, and the Plexi body just looked refreshingly different. However, it was also very heavy, and more difficult to make than wooden guitars. Ampeg and Dan Armstrong parted ways in 1971, and the guitar was no more. However, the model has been reissued and is currently available. Ampeg also do cheaper versions made of mahogany or swamp ash. The guitars have been most famously used by Dave Grohl of the Foo Fighters and Keith Richards of the Rolling Stones. Current prices for originals are high, and the 1970s models are rare. The armies of 1970s Ampeg copies by Ibanez and Shaftesbury are also rare and collectable, but prices for the reissue start at Â£450-ish for the wooden ones, and the Plexi reissues are about Â£1000. Yamaha is now a huge corporation covering all aspects of musical instruments, and more products including motorbikes. However, in 1976, when the SG2000 was introduced they were very much still an upstart company trying to make a name for themselves. In 1973 they had introduced a range of Gibson inspired SG models- equal cutaway designs with mahogany bodies and set necks- very much like a Gibson Les Paul with two cutaways. They were nice, high-quality guitars, however a classic model was what Yamaha needed to boost this new range, and in 1976 the SG2000 proved to be just what they were so badly in need of. 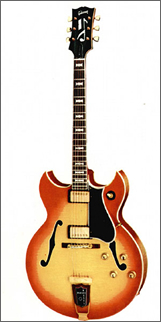 The SG2000 was thus far the most desirable model Yamaha had ever made. It included a through-neck instead of the set-neck construction used by previous SGs, meaning greater sustain and playability. 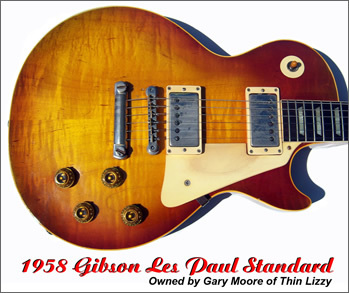 It was, like the other SG models, met enthusiastically, especially given that the Japanese copy boom was at its peak in around 1976, whereas the SG, while influenced by Gibsons, was still an original enough design. 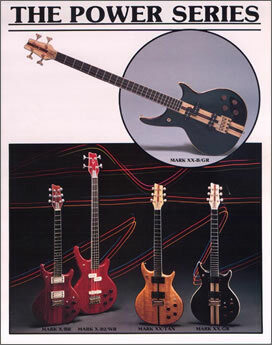 The SG2000 was based on an earlier Yamaha, the SG175, but had refinements over the original design. 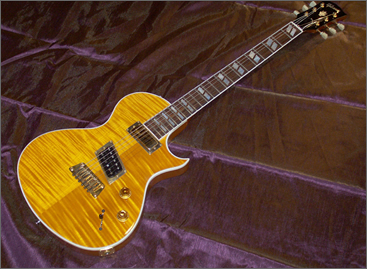 These included a contoured body to make playing more comfortable, a maple top, gold hardware and a fine-tuning bridge. The SG2000 was met well, and became known as a serious alternative to Gibsons of the time. It is still held in high regard as possibly Yamahaâ€™s highest-quality guitar ever, and the one that gave them a serious foothold in the guitar market. 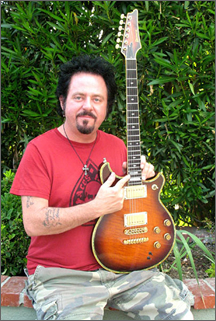 As such many were sold, and they have been used by a handful of well-known artists, the most notable being Carlos Santana, Bill Nelson of Bebop Deluxe and Stuart Adamson of the Skids and Big Country. 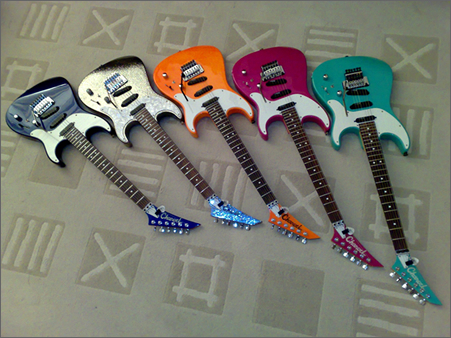 The SG2000 is probably the biggest selling model in the SG range, and used examples are not uncommon. 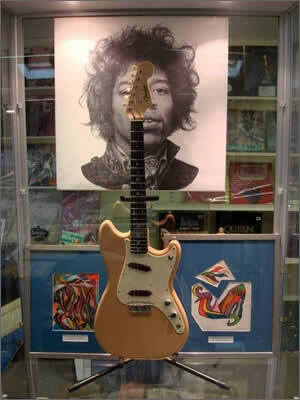 Prices are still high for these desirable guitars, and usually reach between Â£600 and Â£1300. Guy Mackenzie from West Cornwall, who bought the guitars, described them as “the holy grail” of his collection. Mr Mackenzie heard about the find from a friend who knew he collected “weird and unusual” guitars. “As soon as I tracked down these ultra-rare instruments – apparently some of the very first made by UK legend Jim Burns – I just had to meet the owner,” he said. 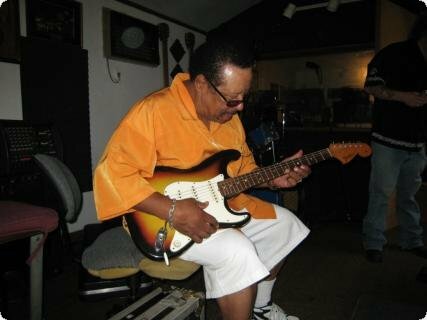 Jim Burns’ guitars have been played by pop groups and stars including The Shadows, The Searchers, Slade and Queen’s Brian May. “Musicians who play them now include Andy Bell of Oasis, Franz Ferdinand, Kaiser Chiefs and The Kooks,” said Mr Mackenzie. Paul Day, guitar expert and author of “The Burns Book” on Jim Burns and his guitars said: “In nearly 50 years of playing, working on and writing about the electric guitar, this is the first time I have actually seen one Supersound instrument, let alone 12. 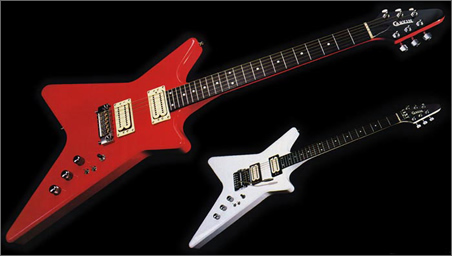 The Hamer Phantom is a very rare and collectable guitar, built in limited numbers in the 1980s. It started out as a prototype, called simply the Hamer Prototype. It was special in that it had a very unusual three-coil pickup at the bridge. 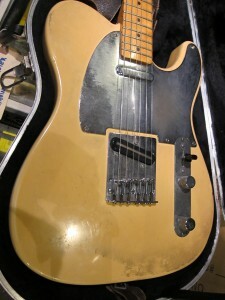 Some also had one single-coil at the neck. It was based on a good-looking Superstrat shape, with the bass side horn being elongated and the treble-side shortened. 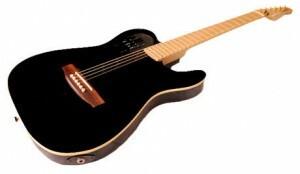 It resembled a coupling of a Fender Jaguar and a Jackson Soloist. 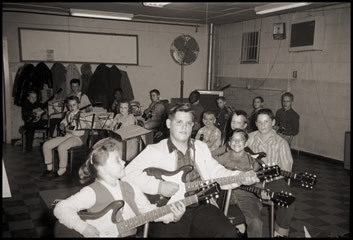 The guitars usually had a scratchplate and Kahler tremolo. Some rare models had an ordinary humbucker at the bridge. All the reviews I have read of this guitar praise it highly, and it is known as a very nice guitar. One notable Phantom user was/is Andy Summers from The Police. Phantoms are rare, but surprisingly inexpensive used considering the looks and quality of the build. I saw two in Denmark Street recently for around Â£800-900, and I am sure they would sell on eBay for much less, in the rare event of one coming up. 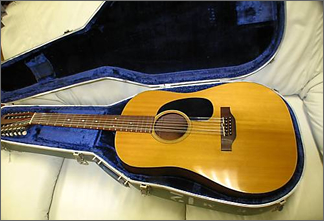 The Ovation company is best known for its acoustic guitars, although they had a very good crack at the solid electric market in the early 1970s (1972 to be precise) with the UKII, the Preacher, the Viper, and the subjects of this article, the Deacon and Breadwinner. 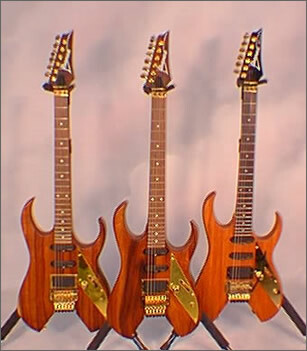 While the former three were fairly normal in design, albeit with traditional Ovation touches in the shapes, the Deacon and Breadwinner seemed almost mutated in comparison, with their bodies shaped somewhat like axes. They also had active mini-humbuckers, rare in the 1970s. The difference between the Deacon and Breadwinner was not immediately obvious to the casual viewer. The Breadwinner was the more basic of the two, with dot inlays, no binding on the fingerboard and a larger scratchplate. 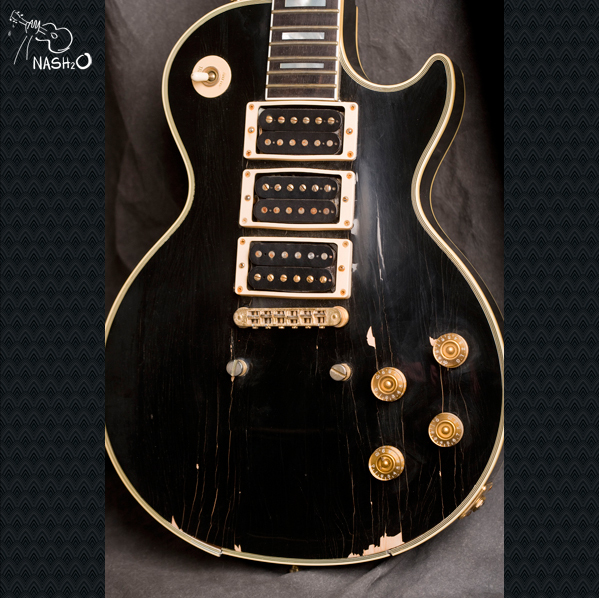 The Deacon had diamond inlays, binding, a smaller scratchplate, and was only available in natural finishes. The Breadwinner and Deacon were often seen in the hands of Â Jeff Lynne of the Electric Light Orchestra, Steve Marriott and occasionally Ace Frehley of KISS. 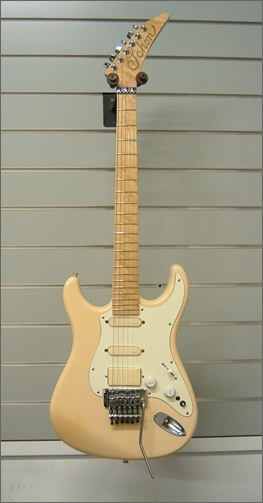 On a recent trip to Denmark Street I found a white Breadwinner for sale for around Â£800. They are rare and quite collectable even though sales never took off originally.